This book is the 4th book in the series so you should read the other ones first, but this is the best out of the series. In this book Larten and his lover Alicia who is not a vampire travel to Paris together, that night Alicia gets murdered by he thinks a vampaneze named Randal Chayne who murdered Zula Pone in the last book. Larten goes around the world searching for Randal so he can kill him in cold blood. Larten finds a vampaneze by the name Holly-Jane and asks her where he is. Holly says she hasn’t seen him in a few years because she thinks he might be dead. 10 years later Larten performs in the Cirque Du Freak to show his daughter Sylva that he is a vampire. That night Sylva says she saw Alicia’s killer talking to Larten. He now knows it isn’t Randal Chayne. The killer is actually Larten’s half blood brother Wester and he also killed Randal Chayne. Larten finds Wester and kills him. Then Larten doesn’t know what to do so he performs with madame Octa in the Cirque. 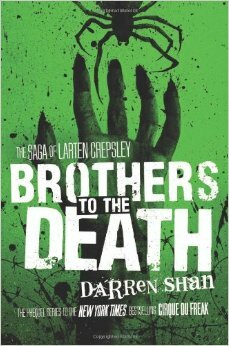 This book leads into the Cirque Du Freak series with Darren Shan.